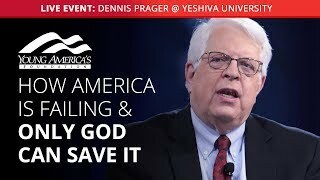 Widely regarded as one of the most eloquent and powerful speakers of his generation, Dennis Prager has lectured in nearly every one of the 50 states and all seven continents. Every week, Monday thru Friday, he hosts a widely popular and influential nationally syndicated radio talk show – the Dennis Prager Show – 9am to noon (Pacific). He can also be seen regularly on Larry King Live, Hannity and Colmes, Hardball, CBS Evening News, The Today Show, and other news shows commenting on current events. In addition to his daily radio show and lecturing, Prager is a prolific commentator, writing a weekly column that is syndicated in Creators Syndicate. His writings have also appeared in other publications including The Weekly Standard and The Wall Street Journal. He is the author of four books The Nine Questions People Ask about Judaism (with Joseph Telushkin), the mostly widely used introduction to Judaism in the world; Why the Jews: The Reason for Anti-Semitism (also with Joseph Telushkin); and two best sellers, Think a Second Time and Happiness Is a Serious Problem. Prager has also produced three films: For Goodness Sake and For Goodness Sake II, two very popular films on the subject of goodness and Israel in a Time of Terror, a compelling documentary on the way Israelis deal with terror attacks. Prager was a Fellow at Columbia University’s School of International Affairs, where he did graduate work at the Middle East and Russian Institutes. He has taught Russian and Jewish history at Brooklyn College. President Ronald Reagan appointed him to the U.S. Delegation to the Vienna Review Conference on the Helsinki Accords. He also has received an honorary doctorate of laws from Pepperdine University.